Dustin Johnson leads the 2019 WGC-Mexico Championship leaderboard as the weekend begins at 11-under par. Hot on his heels are Rory McIlroy and Matt Kuchar, who are sitting at 9-under. Johnson and Kuchar both shot 4-under on Friday and come armed to Saturday's third round with plenty of momentum. Amateur and professional bettors alike are scurrying to enter their 2019 WGC-Mexico Championship picks on who wins it all, and the action resumes at 11 a.m. ET on Saturday. Not surprisingly, Johnson is the Vegas favorite with 2019 WGC-Mexico Championship odds to win of 6-5, while McIlroy is listed at 3-1. At stake is a mammoth $1.745 million to first, and there's a steep drop-off to the runner-up, who will take home just under $1.1 million. Before you make any 2019 WGC-Mexico picks for the weekend, check out the latest PGA predictions from SportsLine. 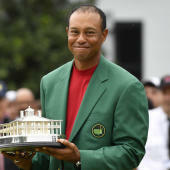 SportsLine's prediction model, which was built by DFS pro Mike McClure, has nailed four of the last eight majors entering the weekend and called Tiger Woods' deep run in the PGA Championship despite being a 25-1 long shot. The model has been spot-on early in the 2018-19 season. It was high on champion Rickie Fowler at the 2019 Phoenix Open, projecting him as one of the top six contenders from the start. It also correctly predicted Brooks Koepka's (9-1) victory at the CJ Cup earlier this season. Additionally, it correctly called Bryson DeChambeau's (9-1) seven-shot victory at the 2019 Omega Dubai Desert Classic. Anyone who has followed the model is up huge. Now that the field for the 2019 WGC-Mexico Championship weekend is locked, SportsLine simulated the final two rounds 10,000 times, and the results were surprising. One huge shocker the model is calling for: Woods, a 20-1 long shot to win it all, makes a strong run at the title. He's a target for anyone looking for a huge payday. Woods followed an opening-round 71 with a 66 on Friday, vaulting him to eighth place at 5-under. The model is calling for him to take that momentum and continue to climb up the 2019 WGC-Mexico Championship leaderboard on Saturday and Sunday. He's a strong value pick at 20-1 WGC-Mexico odds. Another surprise: Ian Poulter, who enters the weekend tied for sixth overall at 6-under par, stumbles in the final two rounds and barely finishes in the top 10. Poulter has been consistent thus far with a pair of 68s the first two rounds, but he's posted a 70 or worse in the final round of four of his last five tournaments, including a disappointing 74 at the WGC-HSBC Champions event last fall. Poulter is 111th on the PGA Tour this season in driving distance at 290.1 yards per attempt and 62nd overall in scoring average at 70.9. And with a star-studded top of the leaderboard to contend with, there are far better values than the 30-1 he is getting heading into the weekend. Also, the model says four golfers with 2019 WGC-Mexico Championship odds of 30-1 or longer make a strong run at the title. Anyone who backs these underdogs could hit it big. So who wins the WGC-Mexico Championship 2019? And which long shots stun the golfing world this weekend? Check out the weekend WGC-Mexico Championship odds below and visit SportsLine now to see the full WGC-Mexico Championship projected leaderboard from the model that nailed the winners of four golf majors, and find out.